For appetizers, we had the Crisp White Cheese Salad (Php 285). The salad has mixed mesclun, orange, pistachio, white cheese and passion fruit vinaigrette. I love how the vinaigrette makes the salad a bit sweet but to overwhelm the whole salad. Other appetizers we had are Bucket of Bacon and Ranch Dip (Php 275) and Bacon Crusted Chicken Tenders (Php 379). For the mains, we were served the Chunky Chili Con Carne (Php 375) and the Slow Roast Beef (Php 675). Served with cheese bread, the Chunky Chili Con Carne wasn't as spicy as I expected, but it was explained to me that it was to accommodate people who don't like spicy food that much (myself included). The beef lover that I am, I drawn to the Slow Roast Beef, served with colcannon (a mashed potato of some sort) and deep-fried egg. The meat was very tender that my knife was almost useless. We were also served pizza: BBQ Chicken and Coriander Pizza (Php 345) and Smoked Salmon and White Cheese Pizza (Php 395). The BBQ Chicken and Coriander Pizza is a bit on the sweet side because of the BBQ sauce, but it was balanced by the flavor from the coriander. The Smoked Salmon and White Cheese Pizza was generously topped with slices of salmon and white cheese that for someone who loves red meat, I loved it. Seriously, I couldn't choose which one is better because I loved both. I was really excited to try URBN's Cheesecake, but our host has another lovely dessert in mind: the Bacon Brownie Smores (Php 255), which sounded like everything I want in a dessert. The Bacon Brownie Smores has a gooey marshmallow and bacon sandwiched between two brownies with a scoop of vanilla ice cream on top. The contrast of the warm brownie and the ice cream creates an unexplained play in my mouth, made better by the combination of the sweetness of the marshmallow and the saltiness of the bacon. More than a lovely dessert, it is a feast for the senses. Thanks to Tricia, Yoko and Rhey of URBN Bar & Kitchen for having us. 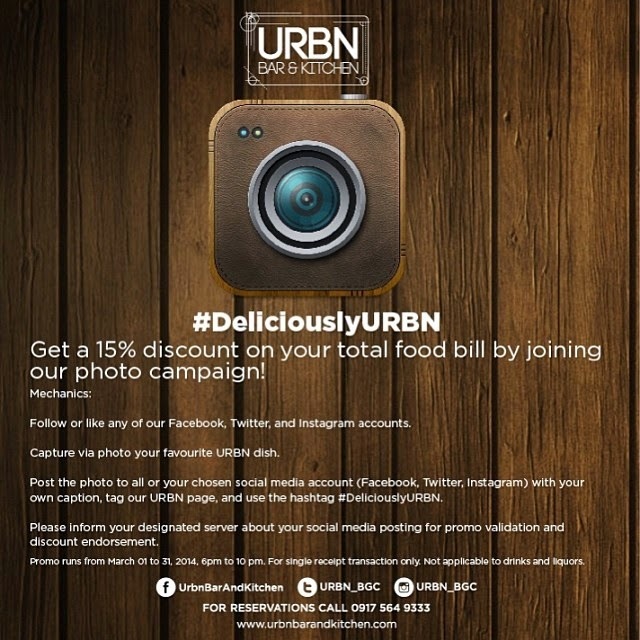 I love the food in URBN its cozy and homey and hearty.. I like the interior design - the tables look awesome :)) And the food looks mighty fine too! Anything with bacon is a sure win, for me though. Haha! URBN is in The Fort, no wonder I never heard of it before haha.. I don't frequent that part of the planet that much but I think it's not too late. I want to try the cheese pizza. Also I want to see it at night and maybe party like a 20 something.